Extreme cold temperatures put your home or business at risk for frozen pipes. As water freezes, it expands and puts pressure on pipes. When there’s too much pressure on pipes, they burst. Most times, the areas you need to be most concerned about are unheated areas, like garages and basements. Every year, West Bend adjusters handle numerous burst pipe claims thanks to the extreme Midwest weather. Often times, these claims are on second homes or vacation properties. “These losses can be very large as the water can run for weeks,” says Scott Thomas, director of claims. In Scott’s experience, most of these situations occur when a furnace fails, or the heat is turned down too far. These losses can be minimized by someone checking on the property during extreme weather and by utilizing remote temperature monitoring technology. Even if heat is maintained at comfortable levels, pipes on outer walls can freeze during extreme weather. Luckily, there are steps you can take to help prevent this from happening in your home or business. 1. Insulation is Key: Pipes that are exposed such as sprinkler lines or hose bibs are most likely to freeze. Garage and unheated basement pipes are also susceptible to freezing. Adding a layer of insulation to these pipes can prevent them from freezing. Go a step further and add insulation to your basement and attic to help maintain the temperature in cooler areas. 2. Monitor Your Heat: Try to keep your heat at one setting day and night. I know, heating your home or business can be very pricy but the added expense on your heating bill is much less than the cost of a broken pipe repair. If you plan to leave town for a few days, don’t set your heat to lower than 55 degrees. 3. Open Cabinets: Open your cabinet doors and allow heat to circulate around the plumbing under your cabinets. 4. Allow Water to Trickle: Keep your faucets on just enough so they drip, this keeps water moving and prevents it from freezing. 5. Prep for the Cold: Make sure outdoor hoses are removed and water is shut off to the faucets before winter. If your pipes freeze, there are a few steps you can take to thaw them. 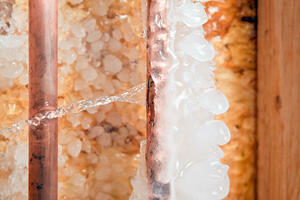 Be cautious; if a pipe in has burst due to a freeze, water will come out and potentially flood your home or business. Apply heat to the frozen area of the pipe. Because the faucet is on, as the pipe thaws, water should start to flow and come out the faucet. Keep heating until the water is back to normal pressure. Make sure to check all faucets in your home too. If you’re uncomfortable or unsure what to do, don’t hesitate to call a plumber. Do you have any tips or information you’d like to share? I’d love to hear them; please share them in the box below.